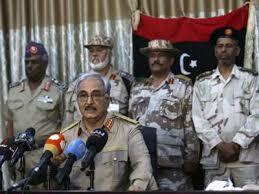 At least four Libyan soldiers died when forces loyal to Khalifa Haftar fought with a local armed group as they sought to expand south, military officials said. Friday’s clashes were the first real resistance the Libyan National Army (LNA) faction faced since arriving in the south two weeks ago from its Benghazi stronghold. LNA officials said clashes began when soldiers left Sabha and arrived in Ghudduwah. It backed troops with air strikes on the “terrorists” and “Chadian mercenaries”, officials said, using a pejorative for Chadian opposition groups active in south Libya. As well as the LNA fatalities, several soldiers were wounded, officials said. There was no immediate confirmation of the LNA’s version and it was unclear if there were other casualties. The LNA spent the last two weeks securing Sabha, nominally under the control of the internationally-recognised government in Tripoli but in practice run by local groups including tribes.